I used to be an expert melon picker. Don’t laugh. It’s a true story. Okay, you can laugh a bit…it’s kinda funny. A few summers ago, I volunteered at a farm stand to keep busy while my clients were traveling. Although I was working full-time as a private chef, I was still pretty new at it and figured that I should make the most of my down time by expanding my culinary skills. The farmers market seemed like a great place to start. We lucky Angelenos have at least one farmers market every day of the week, including my favorite in Santa Monica each Wednesday. While my clients were out of town, I began working at Weiser Family Farm’s stand at the Santa Monica Farmers Market. Weiser Farm sells a variety of produce, including potatoes, carrots, beets, snap peas, onions, and garlic. 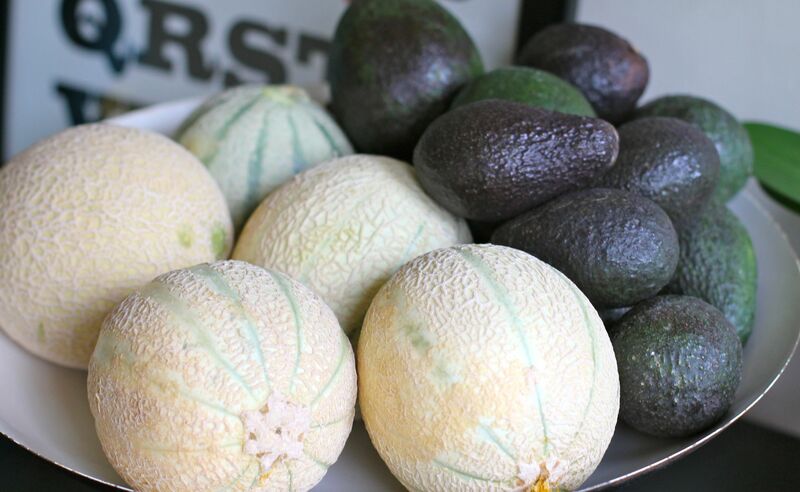 During the summer, however, their heirloom melons steal the show. They grow several varieties of melons and truth be told, they are all excellent. I used to be able to pick the best melons, and stagger them so that they would ripen gradually over the course of the week, or at least until my next visit to the farmers market. When I worked at the stand, I would strategically collect melons over the course of the day. I’d choose one really ripe melon to enjoy after market or after dinner that evening. Then I’d pick another melon that would be perfectly ripe after spending one evening out on the counter. I’d round out my order with maybe 2 more melons that were really green; the trick was to let the green melons sit out on the counter for a couple of days. Green stripes turn to a golden yellow when ripe, which was usually just about the time we’d be ready for more melon. Last week, I learned that I am no longer an expert melon picker. As I mentioned in my previous post, our fridge was empty and well, I went a little overboard in replenishing it. My first trip back to the farmers market in weeks yielded an entire case of melons, which involves somewhere between 7-9 melons. Some of the melons are smaller than what you might find at the grocery story but in any case, 7-9 melons is a pretty big commitment for two people. Back at home, we began eating melon like it was going out of style: yogurt parfaits with melon and granola for breakfast, melon with cottage cheese and salt for lunch, melon with proscuitto for dinner. I cut up melon after melon but we couldn’t keep up; there were too many melons and not enough of us. If I had staggered them better, buying some ripe and others that were still green and needed a few days, we would have had a fighting chance. In my excitement and haste, I bought an entire case of ripe and ready to eat melons. We were overwhelmed. After a busy weekend, I discovered a tupperware of melon in the back of the fridge that was slightly over-ripe. I realize this is a bit of a snotty thing to say…”the melon was slightly over-ripe…” but since you know my background and experience with melons, I feel I’ve earned the right to judge a melon on its ripeness. This discovery put me in a bit of a conundrum: do I toss out my investment and fully accept defeat? Or were there options yet to consider? How could I use up this (slightly over-ripe) melon? 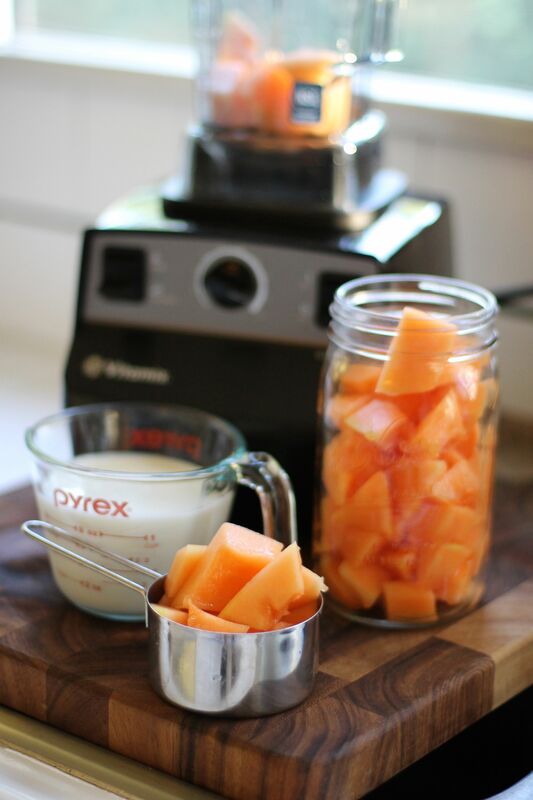 I did what any sane person would do: I tossed the entire bowl of watery melon into the Vitamix, added some kefir to balance out the sweetness (adding probiotics and protein to boot), and had myself one delicious breakfast. It was sweet and tangy, creamy and zippy, cold and refreshing and satisfying…all at once! The added bonus is that it’s pretty to look at too; not essential but always a nice touch when you can turn your leftovers into something beautifully delicious. For the most part, I never use a “recipe” when I’m making a smoothie. I just throw a bunch of things into a blender and hit the power button until it’s liquid-y and well-blended. This strategy works out for me about 95% of the time, resulting in a delicious smoothie. More often, though, I lack inspiration when creating a smoothie. I’m not inspired by the ingredients on hand, or I’m unsure of whether I’ll like all of their flavors mixed up together. I tend to stick to what I know I like. And so when this one turned out so darned good, I felt I needed to share it because it’s an instant classic I’m adding to our repertoire at the bungalow. So read on for the “recipe,” although I would not concern myself with strict measurements. Instead, use my silly discovery as a source of inspiration, or at least as a way to use up a bowl of really ripe melon in your fridge. Your stomach – and maybe even your wallet – will thank you. And when I go to the farmers market this week, I’ll leave the melon picking to the professionals.